Friday, February 3, 2017 was a special day at the African Development Bank headquarters in Abidjan. 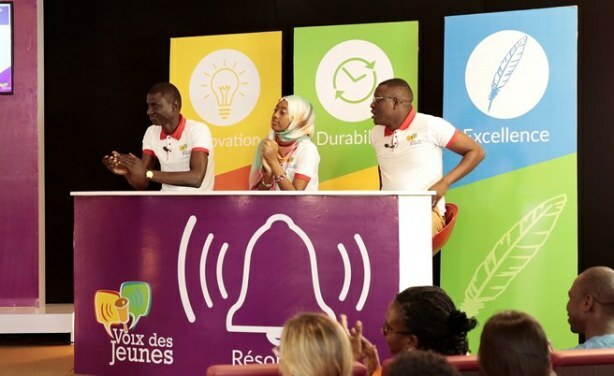 This was the finale of the televised competition "Voix des Jeunes" ("Youth Voices"), launched by the Senegal-based civic leadership centre, Social Change Factory. This year, the chosen theme for the teams is one of the Bank's development priorities: agriculture and youth employment, an issue that cuts across the AfDB's High 5 priorities. The Bank also launched its Jobs for Youth in Africa Strategy in 2016. TV Finale of "Voix des Jeunes" Competition. This year, the chosen theme for the teams is one of the Bank’s development priorities: agriculture and youth employment, an issue that cuts across the AfDB’s High 5 priorities. The Bank also launched its Jobs for Youth in Africa Strategy in 2016.